Ron Hunter announces his plans to make the Tulane men’s basketball an NCAA champion team. 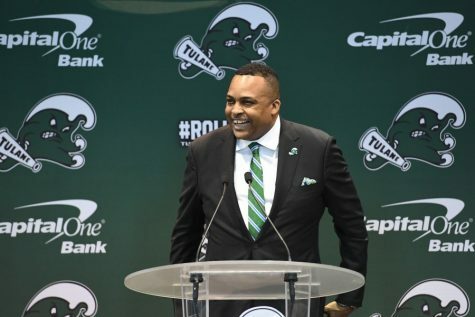 When Ron Hunter was introduced as the 25th head coach of Tulane men’s basketball at Devlin Fieldhouse, he immediately made his intentions clear. Hunter previously coached at Georgia State University for eight years, playing in the less-than-prestigious Sun Belt conference. When he started at this position, the team’s only chance to make it to the NCAA tournament was to win the conference tournament, thereby gaining an automatic bid. With this strategy, Hunter led Georgia State to the NCAA tournament in three of the past five years and changed the national perception of the program. Before his time in Atlanta, Hunter spent 17 years coaching at Indiana University-Purdue University Indianapolis, a school in Indianapolis that previously played basketball in Division II. Hunter rose the team up to NCAA Division I and eventually led the program to its first and only NCAA tournament appearance in school history. Clearly, Hunter has a track record of taking over struggling basketball programs in large urban cities and lifting them to new heights. He’s ready to do the same at Tulane. The Green Wave plays in the American Athletic Conference, one of the most competitive outside of the Power Five conferences. The team doesn’t need an automatic bid to reach the NCAA tournament. Tulane has better weight rooms and training facilities than anywhere Hunter has ever coached. From Hunter’s perspective, this might be his best starting point yet. Hiring Hunter to rekindle the struggling program was no small feat, and the university made sure the coach received a proper New Orleans introduction. Hunter and President Mike Fitts paraded alongside a second-line band down McAlister Drive, before doing an extended open press conference in which hundreds of students were in attendance, eager to see the new face of the program. The turnaround, however, might not happen overnight. Hunter is taking over in March, at a point in the recruiting season where many high school prospects have already committed to their programs. Veteran players Samir Sehic and Ray Ona Embo both have potential futures as professional players and may opt to leave Tulane early. Still, according to Hunter, the improvement is going to happen. He is ready to make it happen. Athletic Director Troy Dannen is ready for it to happen. The Tulane community, both current students and alumni, are ready to see their team make the NCAA tournament for the first time since 1995. Tulane has every resource it needs to be a competitive basketball program. It is time to make it a reality.